Shaky inner pulse? Eat this book! As drummers we are the kings and queens of time. Whether you are a great ruler or not, first of all depends on your inner pulse. Here is a book that covers exactly that: Your Inner Pulse Trainer. Okay, there is no doubt about drums being a very cool insrument. Often times the people playing them are even cooler. Drums have come a long way and they are so versatile. You can experience them on the streets in Africa, Asia, South America, in concert halls with classical orchestras, on festivals with pop and metal bands, in jazz clubs and so on. They delude young and old by their infinite rhythmic force. Drumming should be fun first and most of all. It makes awesome noise(s) and has to offer great satisfaction in return. But if you want to play music with your drums things get more tricky. Our number one job as drummers is not to play the loudest, fastest and flashiest, it is to keep the time within a band. Furthermore drummers take responsibility to add groove to a song and to therefore make people wanna move. Is that easy to do? No. Do you need a certain talent for that? No, but it would help. Can you learn how to groove? Of course. 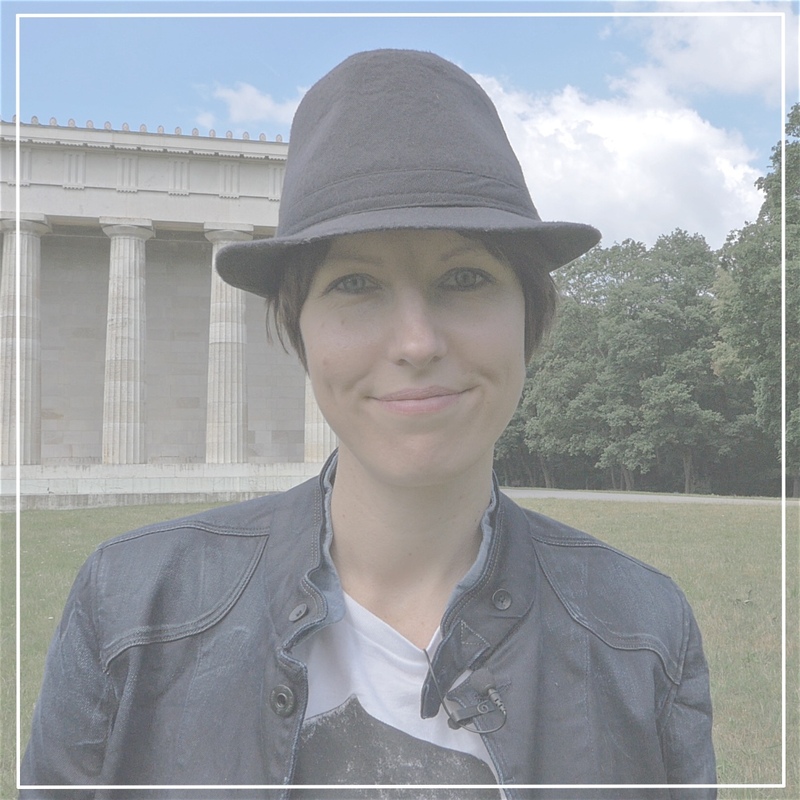 Matt Halpern gave away the ultimate instruction to me some weeks ago: “The more you move, the more you groove.” Check out my interview with him to find out more. And can you learn how to keep great time? Absolutely! All you need to do is not to drag and not to speed up. Yeah sure, that sounds easy. However, I am afraid there’s some work involved. The rhythms you play have to sound exact in time and tone – no matter what’s going on around you. For all rhythms relate to a given pulse, you need to be aware of it and you need to internalize it. Luckily we already have an inner pulse that is able to estimate time. Nonetheless, you need to calibrate it perfectly, in order to keep time confidently. The book comes with five chapters. So how can you achieve better time playing? Of course it helps to play along to songs. Maybe not to any, but to those with great time, feel and groove. Joe Porcaro once told me his son Jeff, the legendary studio and Toto drummer, got his time from playing along to Beatles’ records. Speaking of studio, when recording a track, it’s most likely that you will have to play along to a clicktrack. 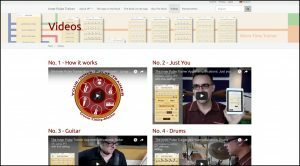 Are you used to play to a metronome? If you are fine with that, you are one step ahead already. But what happens, when such outside references and guides aren’t available? Are you still able to keep the time? Do you have a stable reference point inside yourself? If not, how can you establish one? 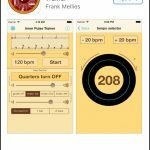 Well, German drummer Frank Mellies programmed an app to help. In addition he wrote a whole book named Your Inner Pulse Trainer. In there he explains his method of discovering the pulse within yourself. It comes with lots of exercises. Let’s have a look inside. The good news first: the book is available as a bilingual edition in German and English. It addresses all instrumentalists and it comes as a loose-leaf binder with nice thick paper and even some foldout pages. 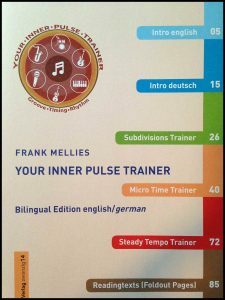 There are five chapters to the book: Introduction, Subdivisions Trainer, Micro Time Trainer, Steady Tempo Trainer and Reading Texts. 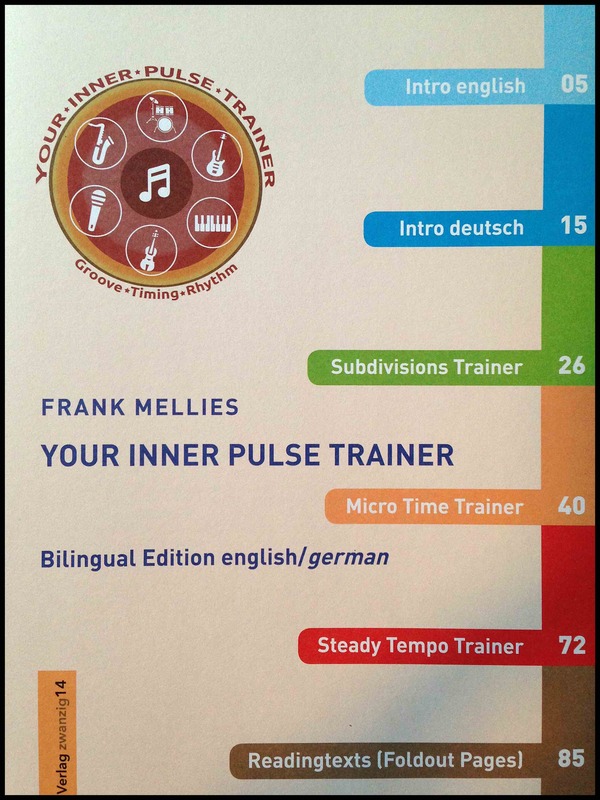 There’s a catch though: If you want to seriously work with the book, you also need the Inner Pulse Trainer App. Luckily it’s available for both iOS and Android devices and costs 4,99 Euros on iTunes and 4,89 Euros on Google Play. Now, if you got both, book and app, in front of you and made it through the intro, you can start practicing. 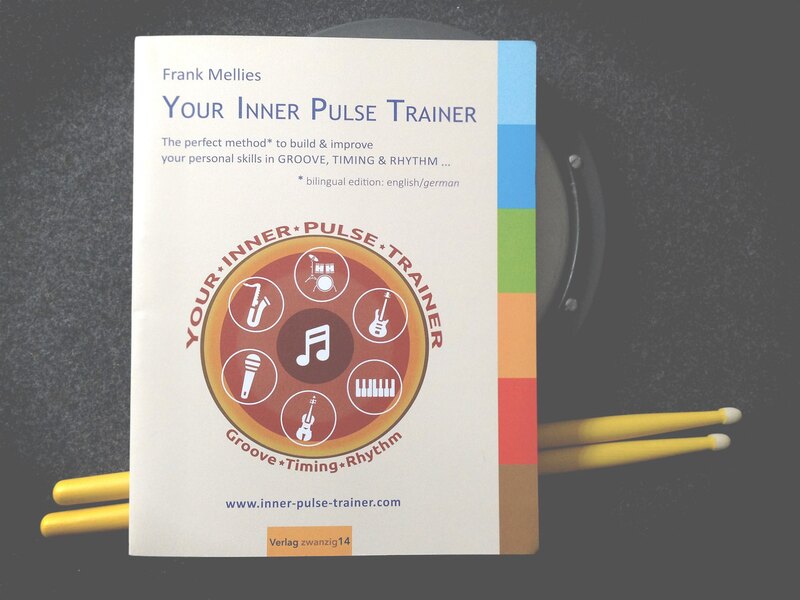 Frank Mellies wants you to listen, play and vocalize patterns, pulses and rhythms. He takes you on a ride through three sections. In each one the focus is a different one. 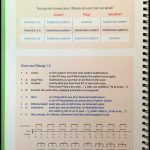 While completing the exercises of the book, you work on developing an understanding and feeling for a) pulse and subdivisions, b) micro time and c) keeping pace. What are you waiting for? There is lots of work to do, so have fun! No, stop! Be aware that the book is definitely not for beginners. 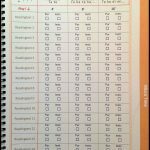 I personally found it a little tricky to understand what I need to do, how I need to use the book and that I also need the app to really get started. That’s also because the book seems a little overloaded. And that’s due to the fact that there are English and German texts right underneath each other. Speaking of, in my opinion they could have been prepared a little better for eyes and ears. Finally, the check lists also take a lot of space and seem a little deterrent. Helpful tutorials are on the Inner Pulse Trainer website. But luckily there are teachers to help you get through something and there is Frank Mellies himself. 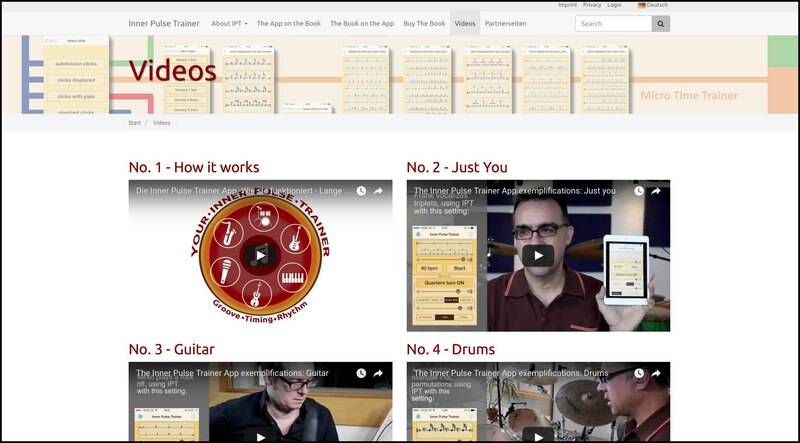 On his website you’ll find a section called videos. It is filled with short explanatory videos, which are of great help. Obviously Frank put a lot of time, energy and money into this method of training one’s inner pulse. Now it’s your turn, make it YOUR Inner Pulse Trainer.